Our Saturday battle was a good time as we got our friend Doc Mercury over to play. He now has a large force of PLO/Militia to paint up and got his first taste of Lebanon 1982 with Mark and myself. This battle changed many times as we were setting it up, and at times as the referee I was not sure what the players wanted to try out...but I do need to remember to always make the IABSM/CDS cards and the sides set before I get to the gaming venue! Mark wanted Syrians, Doc did not care and I was planning on using PLO as that is what I had cards for. The action was very fast as the two platoons headed across the town looking for PLO and a way to exit to the north. 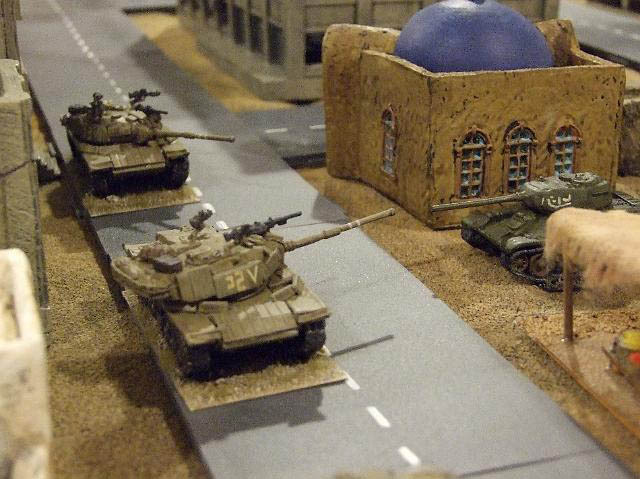 The tank as a decoy allowed the PLO to assault the tanks. Luck was not with the PLO today as none were damaged and the infantry cleaned out the building. As the Merkavas went past the market a group of Syrian commandos attacked the column. They had as little luck as the PLO. They held the market only a turn before being forced out by the infantry. While all of this was happening the Syrians brought on three T55s. Their only success was against an empty M113. A good game and a great learning experience for me the referee. I look forward to our next game.